If you’ve been listening to most advice dispensed by the so-called experts on the issue, it was a foregone conclusion. Of course there is a connection between allergies and carpet. And it’s not a positive one. Most people believed and many still do that carpet is a big contributing factor to poor indoor health. Here at Zerorez we’ve always questioned that premise. Our own, although limited in quantity and not scientifically vetted, experiences were different. We found that, particularly with clients that adhered to a regular carpet cleaning regimen, both physical and emotional well being actually improved. Years of additional data and research are starting to show a different picture, and actually may dispel some of the myths that contributed to carpets poor reputation. A more complex picture is slowly emerging that shows the contrary is in fact true. Well maintained carpet (key is WELL MAINTAINED) can actually help improve the indoor living environment by trapping and holding dust, pollen and other allergens in place. 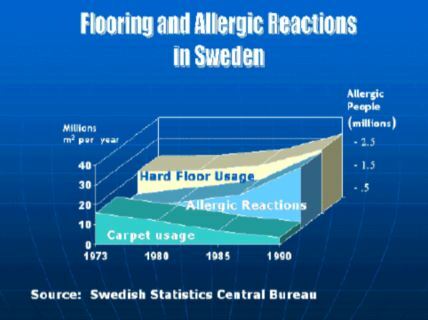 Sweden is a country that has replaced more carpet with hard surface flooring over the last 40 years, than any other. However, their instances of allergic reactions have not decreased as one would suspect based on the premise that carpet causes and/or contributes to allergies. In fact the exact opposite is true. Hard surface flooring is actually worse for your allergies and asthma, according to these scientific studies done in Sweden! So in addition to carpet providing soft, comfortable cushioning and helping prevent slip and fall accidents, carpet also filters the air and keeps allergy and asthma causing pollutants captured within the carpet fibers until they can be removed through vacuuming or cleaning. Both hard surfaces and carpet still require consistent cleaning in order to ensure a clean, healthy environment, but for optimal air indoor air quality, carpet truly is your best choice. And whether you need to have your carpets or your hard surfaces cleaned with our soap and detergent-free alkaline water solution, give Zerorez a call so that we can help you make your home or office a truly clean and healthy and residue-free living environment.